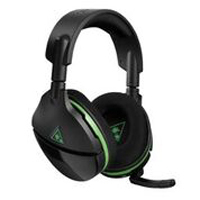 The Turtle Beach Stealth 600 is the latest gaming headset for Xbox One, debuting Microsoft's new Xbox Wireless direct to console technology style with a flip-up mic. The Stealth 600 delivers immersive surround sound plus chat audio through powerful 50mm over-ear speakers, and features Turtle Beach's renowned high-sensitivity mic that can be flipper-up to mute. For comfort, the Stealth 600 dawns the latest iteration of Turtle Beach's unique ProSpecs glasses friendly design, and has a breathable mesh fabric-wrapped headband and ear-cushions. The Stealth 600 also includes Turtle Beach's exclusive Superhuman Hearing sound setting, Mic Monitoring, independent game and chat volume control, audio presets including Bass Boost, and a 15-hour rechargeable battery.